Meet George Cofer, Executive Director of the Hill Country Conservancy. 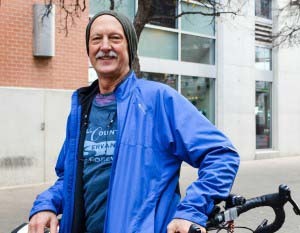 George contributes to Austin’s Net-Zero goal in several ways, including being a bike commuter. George no longer owns a car and uses his bike as his primary source of transportation. We spoke with George on how he did it, what his toughest challenges have been, and what advice he has for others looking to live Net-Zero. Read more below. Well, I didn’t do anything. It truly takes a village! It’s the little things that count when multiplied by 1.5 million Austin area residents, or 9 billion Earth residents. It’s doing small things like setting the thermostat a few degrees cooler in the winter and warmer in the summer, taking shorter showers, not wasting potable water on lawns, using reusable shopping bags – if we all do them collectively, that will get us to Net-Zero. I do all those things – I also walk and bike more, and drive less. Have there been any unexpected benefits to biking? What’s been the toughest part to taking up biking?